This is the first line of our newly–minted Gorilla brand guide. This guide tells a story of hard work and community building, but if we’re being honest, it also tells a story of how, in building a company, we often neglected our brand. Ours is an industry where we need to focus first on the needs of our clients. But we often do that by providing them with services and attention we neglect to provide ourselves. In what attention we did give ourselves over the years, we focused on building our community, our culture, and producing passion projects. But we never really took ownership of our brand. We relied on the work we did and the culture we built to do our branding for us. We wanted our work to tell the story, and the story to be the brand. And for a while, it worked. As is the case with any story left to interpretation, there were also misinterpretations, many of which only revealed themselves over time. Simply put, we didn’t give our story enough attention. We didn’t take the time to tell our story. Our brand “happened,” and we thought that would be fine. But, we realized we could do better. Here’s one example. From the inside, we saw Gorilla as a creative commune—a bit hastily-built, sure— to support the waves of talent and opportunity that kept washing up at our door. It was a community, we said, fueled by ego-less teamwork, intent on lifting one another as we climbed. We thrived on collaboration where each member celebrated the achievements of others before his or her own. “Lift as You Climb” is an accidental bit of branding that helped define Gorilla in its early years. To us, Gorilla was a big, messy, passionate family who left the front door unlocked. We just assumed (naively) that everyone knew they were invited to walk right in and join the party. This inside story was the story we assumed was permeating out into the world as well. We thought our “brand” was self-evident. As we grow, we’re learning to reconsider our assumptions. Perhaps it’s the Malcolm Gladwell-esque hours of experience earned from branding and marketing our growing slate of feature films, or, perhaps, it’s simply our collective maturation to embrace our failures as the path to growth. Regardless, we recognized that the story we were telling ourselves was not always the story being heard. To paraphrase a wise friend, “there’s a big difference between being told you belong and feeling welcomed.” The reality is that, from the outside, Gorilla felt more like a club. Sure, not everyone felt this way, but we realized that for those who did not have an existing point of connection or the brashness to just walk through the door, it appeared to be locked. It felt like you needed a secret passcode. By neglecting our brand for so long, we had neglected to the story we tell of who we are, why we are, and what we value most. And in not communicating, we found we were communicating. Just not the stuff we wanted to communicate. So, we finally got our heads out of our asses, got to work, and did something about it. 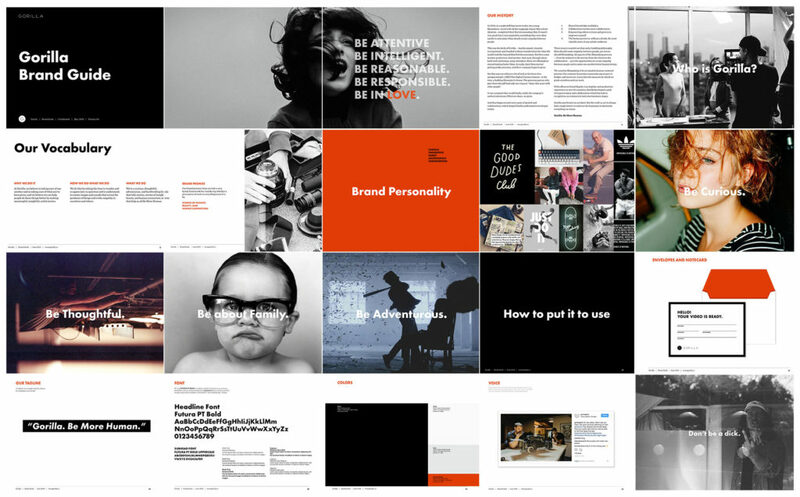 An assortment of pages from Gorilla’s brand guide. Today, we’re proud to share the results of our rebrand work. We began months ago with some insightful client research conducted by our friends at Pivot. It continued through weeks of internal strategy and design. And most recently, today, it takes form in a web experience designed in collaboration with our pals at Conduit Studio. All of this comes together to launch a brand which we hope demonstrates our intentions more openly and tells a better story, not just of who we are, but of who we want to be. For example, many of our clients see us solely as a production company, and that’s perfectly fine by us. Film production is where our journey began and it is often the core form of our storytelling. But over the years, we have grown to provide a range of creative services around that core, and sometimes, even without making a film at all. From branding to design, photography to social media, VR, animation, graphic novels, and so on, our offerings have increased quite a bit, even if our commitment to great storytelling hasn’t. But while we have been refreshed and invigorated by these new services, the foundational principle remains the same. Our strongest creative work—and the best version of our community—emerges when we dive deep into what is most honest about the story we’re telling, when really get our hands dirty finding what it is about the project that is most meaningful, most human. And that’s when we hit it. Meaningful, insightful work is about finding what’s most human. That’s how you tell beautiful stories. That what makes a connection. That’s what builds a strong culture. No matter the medium, no matter the partner, our goal should be, at every stage of the process, to be more human. So we’re still a passionate, empathetic, at-times messy, family that leaves the doors unlocked. And you’re still invited to walk right in. But what we want you to find is not simply a welcoming, creative community. What we want you to find is not simply great work and great partners. What we want you to find is a chance to tell stories of insight, beauty, and human connection. We want you to find something human you can share with your friends. Thanks for looking at the new site. Can’t wait to connect with you.